Wait! Why you should book this villa? 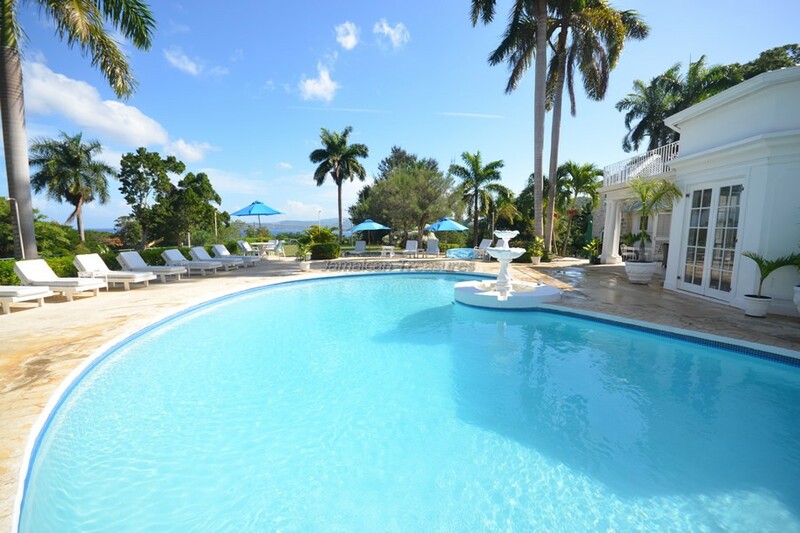 You have found a villa that has a first class Tryall Club Beach and Resort membership + the HARD ROCK CAFE BEACH CLUB + THE MONTEGO BAY YACHT CLUB IN MONTEGO BAY, available for all guests offering! 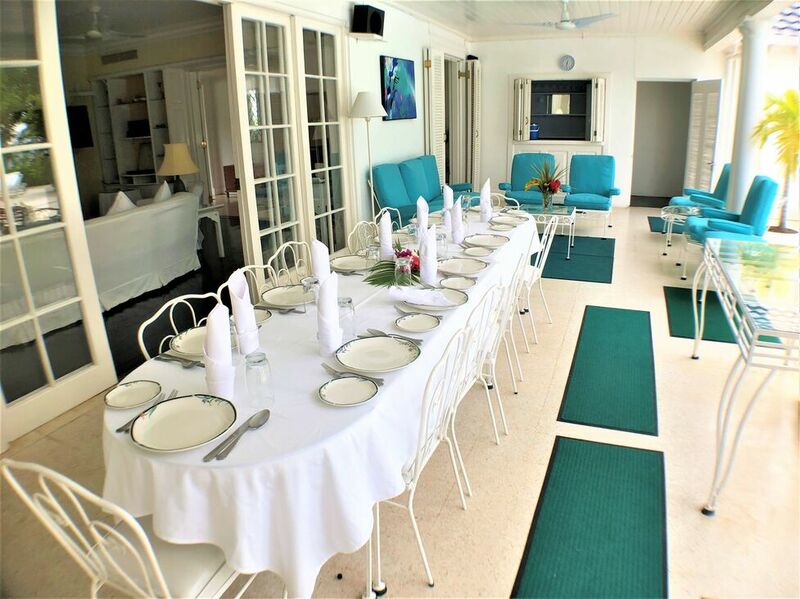 TRYALL CLUB - Access to beach, 9 tennis courts, gym, pool, Hummingbird Kids Club, non-motorized water sports, Internet room, art gallery, jogging trail, afternoon tea & Manager's Cocktail Party. 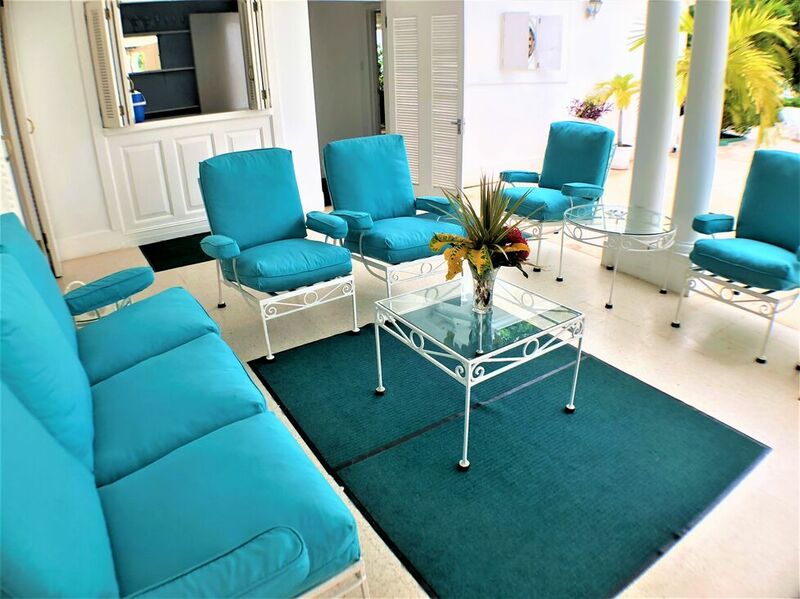 For various fees: Reduced green fees for world championship golf, tennis lessons, Happy Hour, hair salon & spa, bars & restaurants, boutique, motorized water sports, beach parties Mon-Wed-Fri. For discerning guests the luxury and hospitality of a true villa lifestyle. Read the amenties you will enjoy here at the bottom of this page. Fulltime 12 seater van and Complimentary Driver Included for weekly bookings only. Summertime villa is a large private house, located only 15 minutes west of the Montego Bay airport. This villa sits high on a hillside, yet across the road from the waterfront….its high hillside location gives Summertime the advantage of spectacular Ocean views. 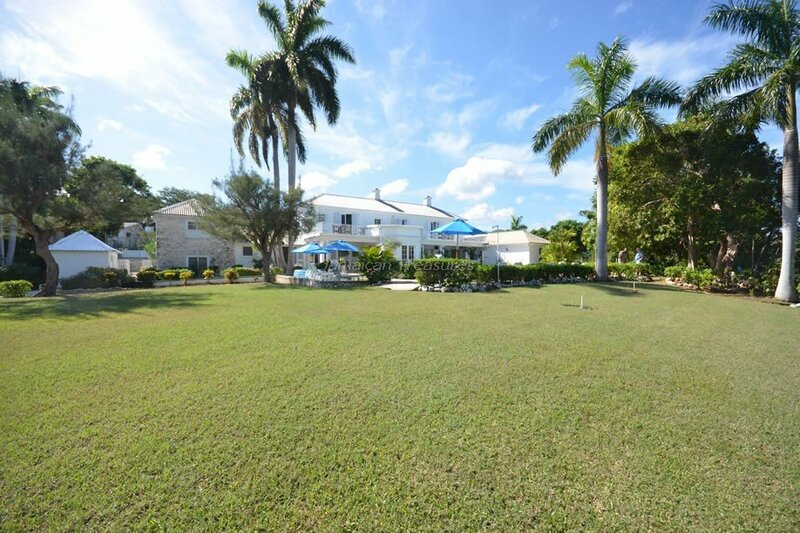 As you drive up the entrance driveway of this lovely villa, you can’t help but see the gardeners work in the landscaped grounds which are surrounded by an abundance of palm trees, crotons, bougainvillea and hibiscus and many of Jamaica’s colorful local species. 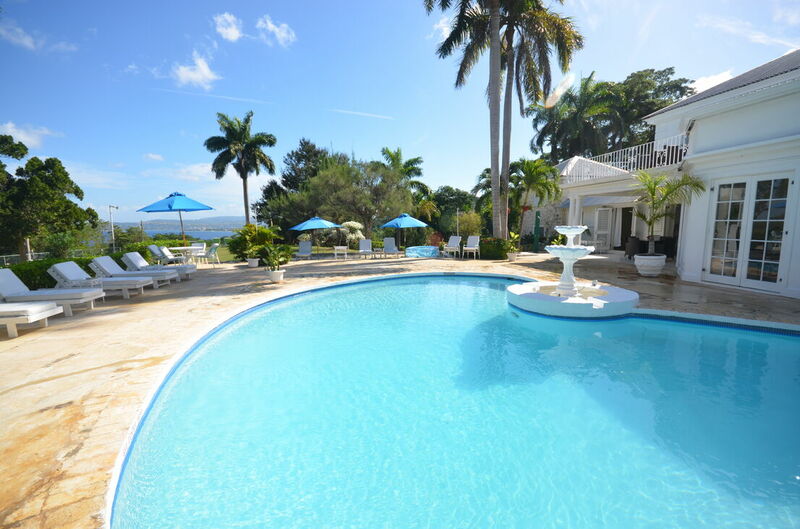 Pharos Summertime Villa is an expansive private house, located only 15 minutes west of the Montego Bay Airport. 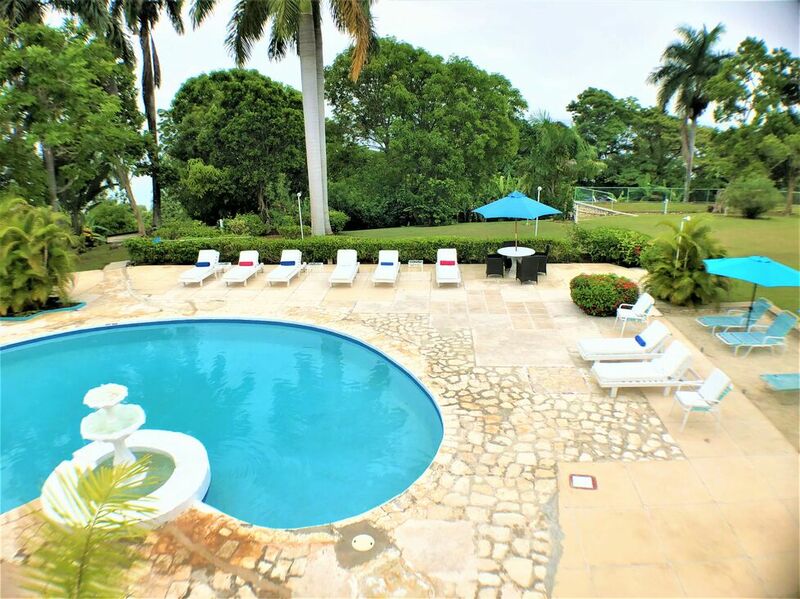 This 6,000 square foot luxury villa Jamaica sits high on a hillside, across the road from the waterfront. The high hillside location gives the villa the advantage of spectacular ocean views during the day and the night. The interiors of Pharos Summertime Villa are furnished very elegantly. Guests should be prepared to be completely pampered and indulged on this holiday! 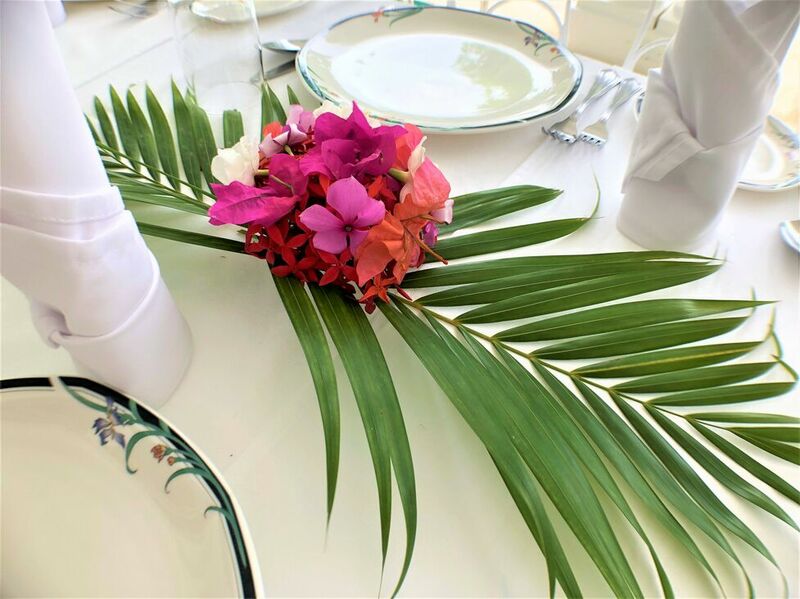 As guests drive up the entrance driveway of Pharos Summertime Villa, they can see the gardeners work in the beautifully landscaped grounds that are surrounded by an abundance of palm trees, crotons, bougainvillea and hibiscus and many of Jamaica’s colorful local species. 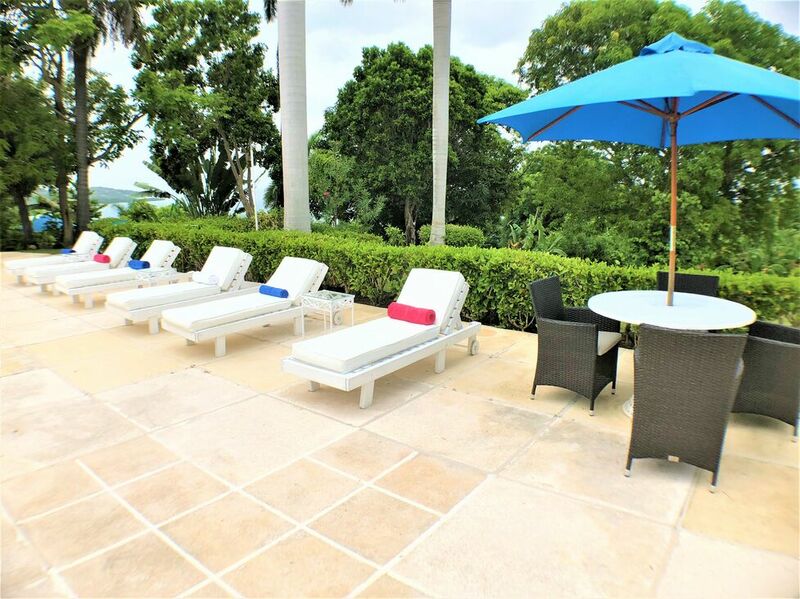 The setting is breathtaking, five acres of landscaped grounds adorned by an abundance of palm trees, bougainvillea and hibiscus, large pool, vegetable gardens and amazing views of sunrises and sunsets. After sunset, the view transforms from brilliant blue water to the mesmerizing beauty of the sea at night, glimmering with reflections of cruise ships and the romantic night-lights of Montego Bay nine miles away. 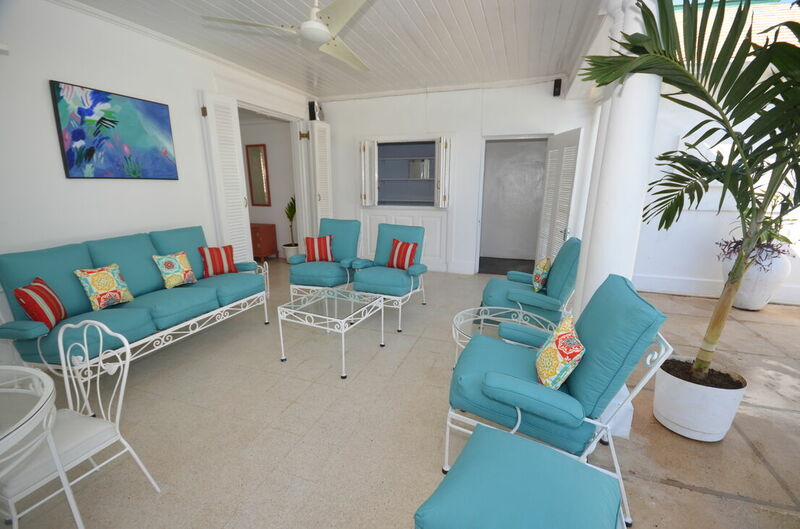 The interiors of this spacious Colonial manor have been tastefully refurbished with elegant fabrics, pretty pastel colors on the walls, and renovation of the kitchen and all bathrooms. The large living room opens to the covered dining terrace and pool. Four bedrooms and the study, which can accommodate one or two extra guests, are on the main level. A mahogany staircase leads upstairs to two more spacious bedrooms with their own sundecks, patio furniture and umbrellas for shade. The living room is classically and elegantly furnished. The entertainment system in the living room at Pharos Summertime Villa includes a 42" TV flat screen Television, DVD and CD players, Sony Play Station 2 and video games, sound system. For families with children, there is an extensive library of children's DVDs and videos. Additionally, wireless Internet access is available for guests who wish to use their laptops. Pharos Summertime Villa has a private tennis court with wheelchair accessible center court seating and umbrellas for shade. 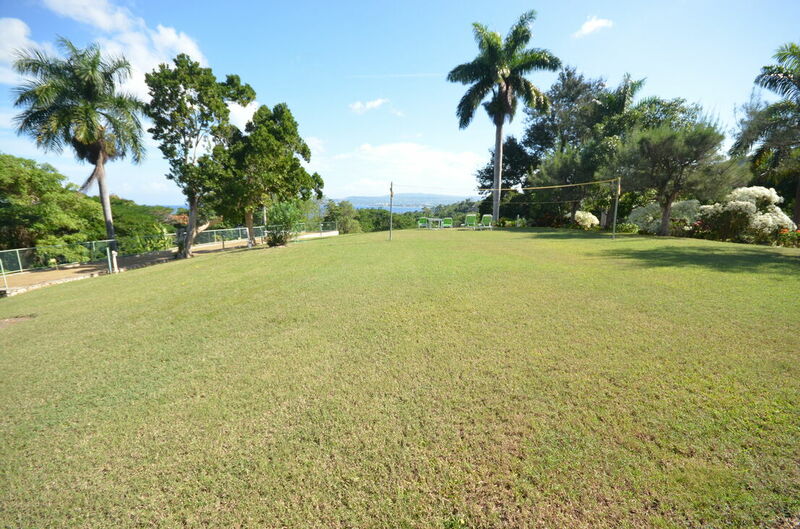 Outdoor games include ping-pong croquet, horseshoes, darts, lawn bowling. 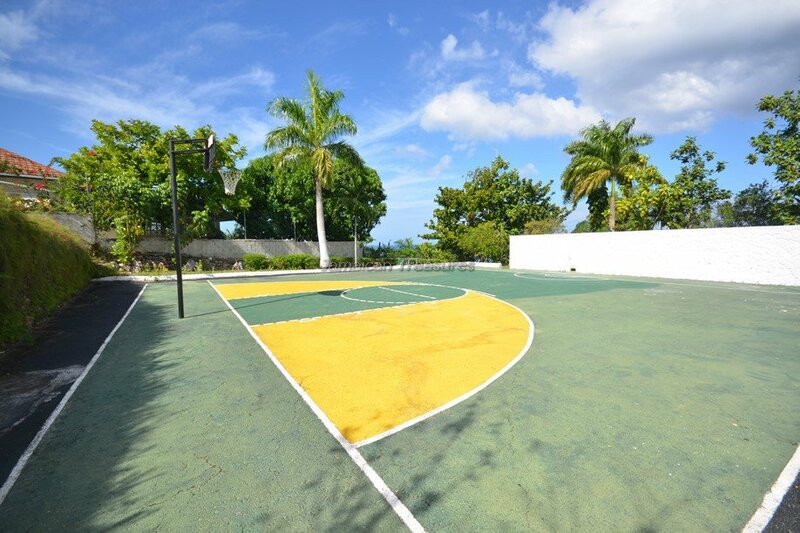 Sport enthusiasts will thoroughly enjoy the volleyball court, the badminton court, regulation size half basketball court and the 9 hole putting green. 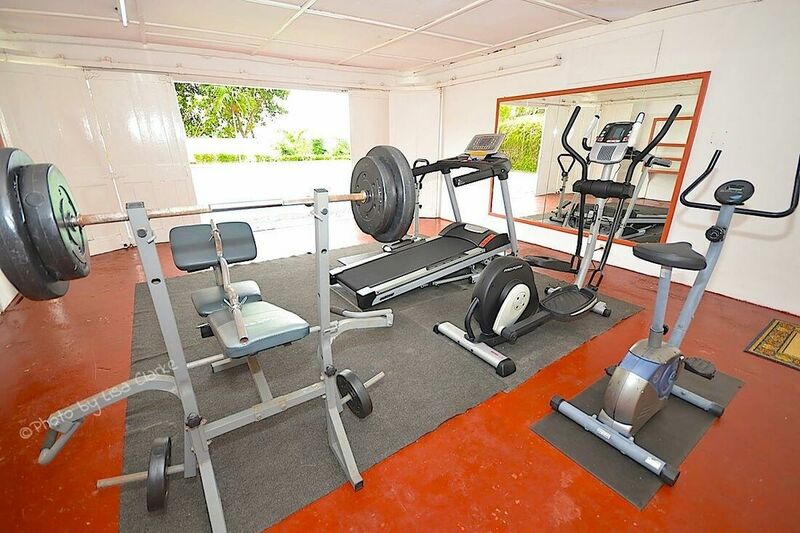 For the fitness conscious guests, the Jamaica villa has an air-conditioned fitness room, equipped with treadmill, Total Gym 1500, weight training machine, stair stepper, stationary bike, TV and DVD player. 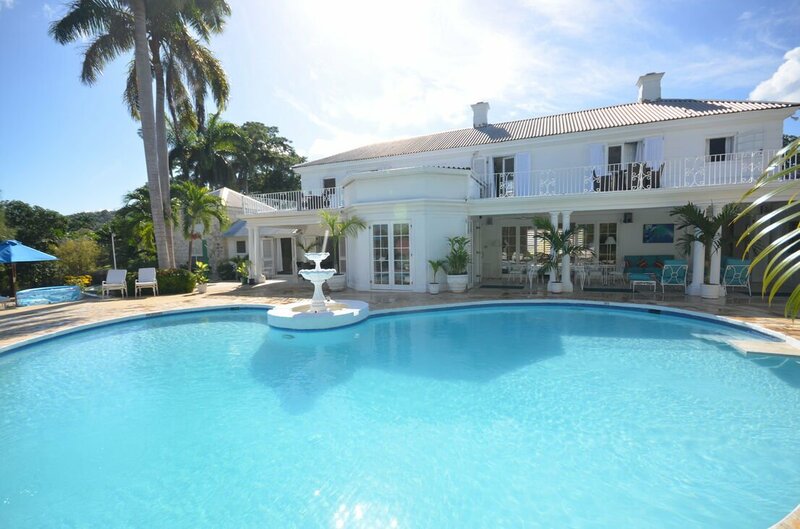 Furthermore, a large private pool and poolside wet bar are available at the villa rental in Jamaica. A children’s sandbox with wading pool, sand toys and umbrellas for shade will help keep the children busy for hours, giving their parents time to relax and unwind. Pharos Summertime Villa offers six very spacious and comfortable bedrooms with wooden floors. The bedrooms are spread out over this large home. 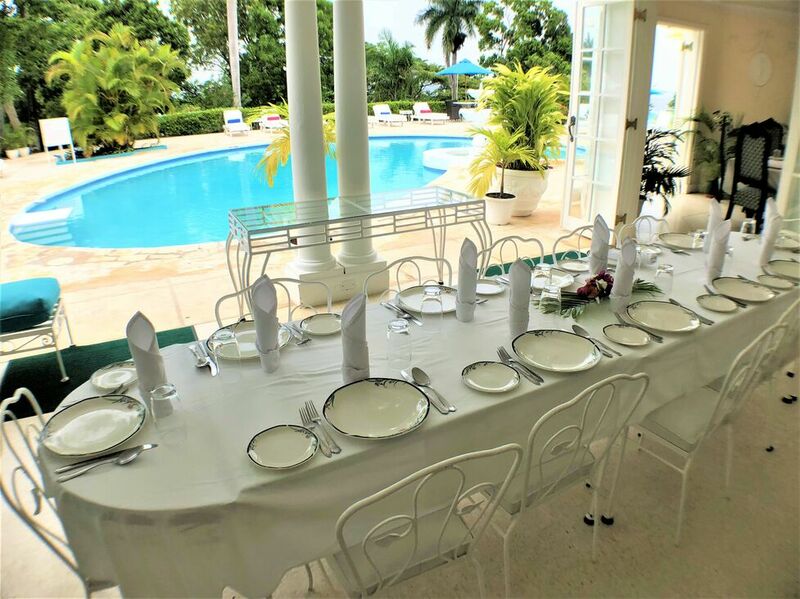 Because the bedrooms are configured in three separate areas, two in the east wing, two in the west wing and two upstairs, this villa in Jamaica is equally appropriate for small groups of only 4 or 6 guests or for a full house of 12 to 13 guests. For families traveling together, Pharos-Summertime offers privacy for couples, family groups, a wonderful choice for families or large groups. Cable service with 32 inch flat screen televisions, DVD and CD players, and air conditioners are available in all bedrooms. King-size bed, large bathroom with bathtub plus separate walk-in shower, dressing room, French doors to rooftop and ocean view, a very spacious private suite. Plenty of extra space here for cribs and cots for kids. King-size or twin beds at guests' option, en-suite bathroom with shower, French doors to rooftop and beautiful ocean view. King-size or twin beds at guests' option, en-suite bathroom with tub-shower combination, opens to west porch with hammock; also opens to pool terrace. Double bed, private bathroom with tub-shower combination, opens to private west porch and hammock for morning coffee, also opens east to pool terrace. King-size option, en-suite bathroom with tub-shower combination, connecting door to Lavender Room; opens to pool terrace. King-size or twin beds at guests' option, en-suite bathroom with tub-shower combination, connecting door to Yellow Room; opens to pool terrace. Shares west wing with Green Room. Twin-size sleigh bed, shares hall bathroom with Green Room. Ideal for child of parents in Green Room. A second twin bed can be added on request. Air-conditioned. 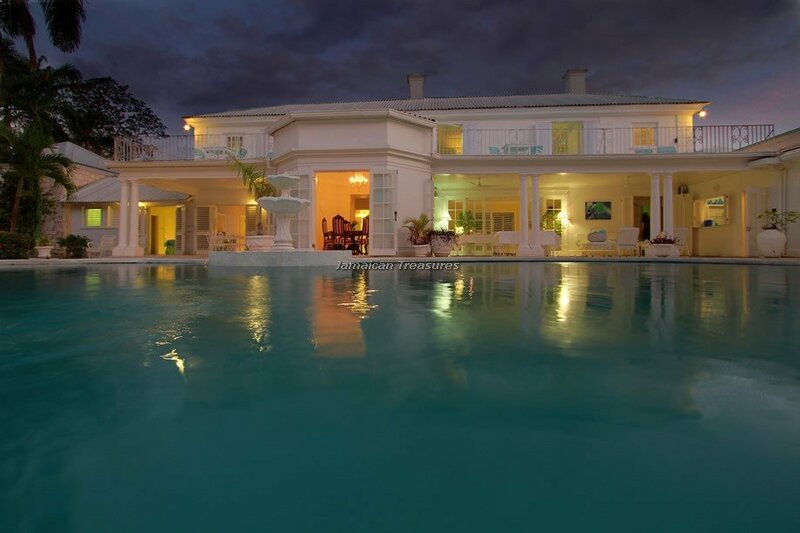 This villa in Jamaica can be rented as a 2 bedroom or a 6 bedroom villa. in either situation, guests will have the entire house to themselves and the other rooms will not be rented to any other party. 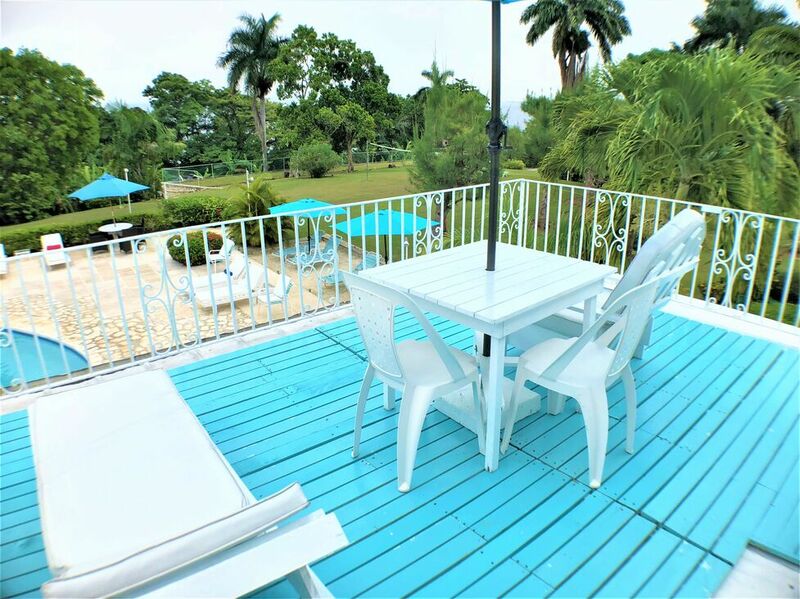 This is an excellent way to have a whole large villa at an affordable rate and enjoy the true feeling of living in a large private mansion on the beautiful tropical island of Jamaica. 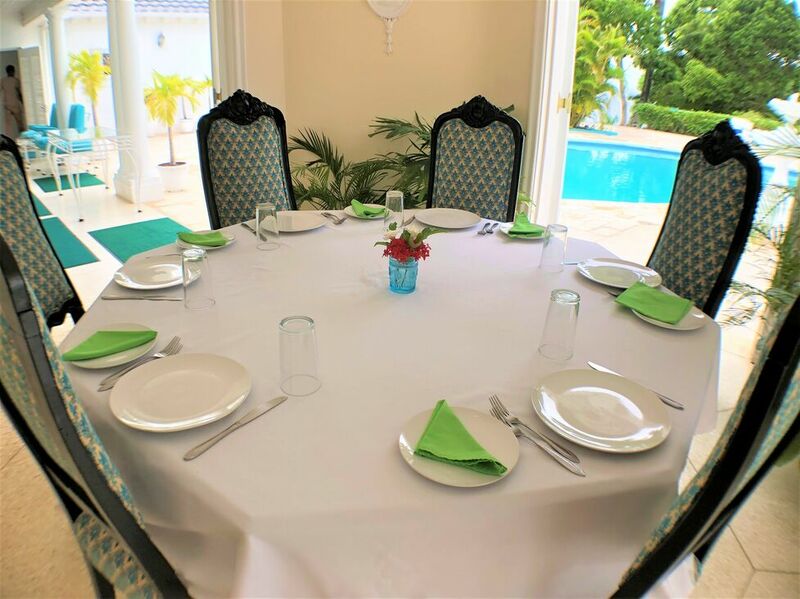 The staff at Pharos Summertime Villa includes the chef, cook, butler, housekeepers, laundress, and gardener who ensure that the guests have a wonderful Jamaican holiday. 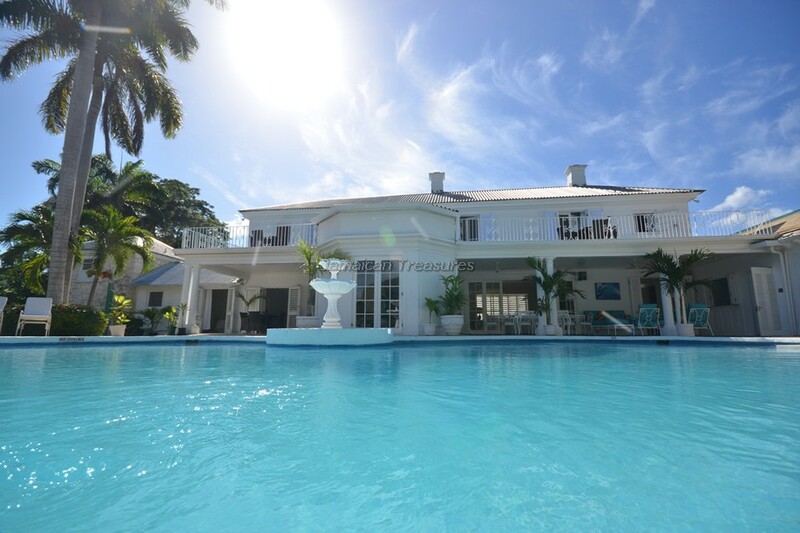 The Jamaica villa is managed by the housekeepers and the laundress gets the laundry done in no time. Delicious meals prepared by the in-house chef are served on Royal Worchester china by the open-air poolside verandah. As a special treat on moonlit nights, meals are served on the terrace beyond the pool overlooking the romance of the lights reflecting across the Bay. Memorable dinners here can last for hours as guests relax into the heady ambiance of good food and drink, excellent service and a magnificent setting. Guest will be well looked after! A complimentary fulltime private driver and air-conditioned 12 seat van is available for excursions to the beach for weekly bookings only. For those who need a larger 15 seat van, this costs $300 extra for the week. Handicap access & handicapped bathroom part of Green Room and Study. "I have never had a vacation where I could totally relax. I think this was the best vacation I've ever been on. It's a joy to have all the kids when someone else does the running around for them. They waited on all of us like royalty!" HARD ROCK BEACH CLUB + MONTEGO BAY YACHT CLUB MEMBERSHIP FOR ALL VILLA GUESTS!!! What can you get with the Hard Rock Cafe + Montego Bay Yacht Club Membership? -On the ground floor there is a wing to the left which has the study which can be converted into Bedroom 7 with 2 twin beds. This bedroom will share bathroom with Bedroom 6. Shower. 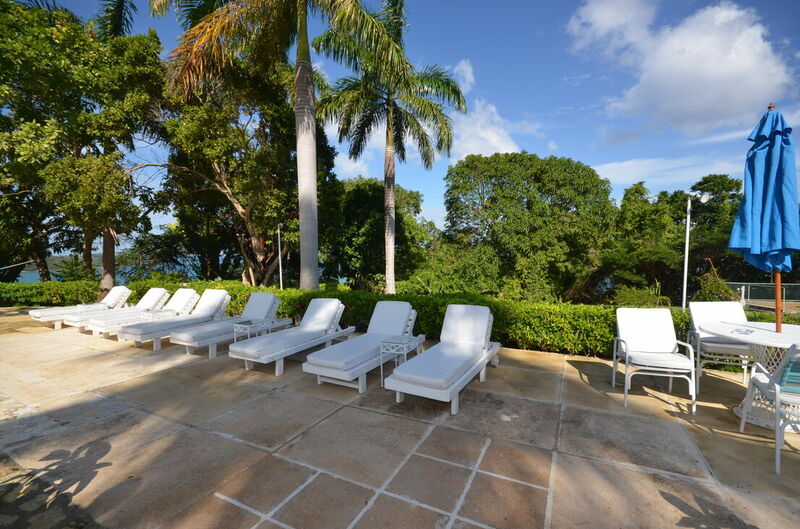 -Bedroom 6 has a double bed, Slight ocean view and walks out to a little patio. This bathroom has a shower which is handicap accessible. 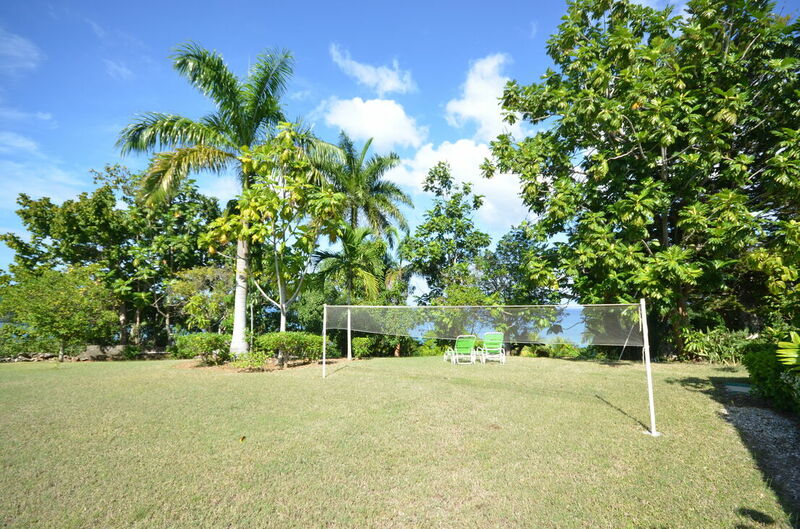 -Bedroom 5 has a king bed and walks out to a patio where there is badminton and table tennis. There is a shower and bathtub. -The next two bedrooms are on the lower level but on the right of the living room. -Bedroom 4 has a king sized bed and walks out to the pool deck. Shower/tub. No ocean view. -Bedroom 3 can interconnect to Bedroom 4 but doesn’t have too. King sized bed and no ocean view. Bathtub/shower. -Up interior staircase to the final 2 bedrooms. -Bedroom 2 King bed with slight ocean view. Walk out to private balcony. Shower. -Bedroom 1 is the Master Bedroom with a King sized bed and slight ocean view. Walk out to a private balcony. Bathtub/shower. 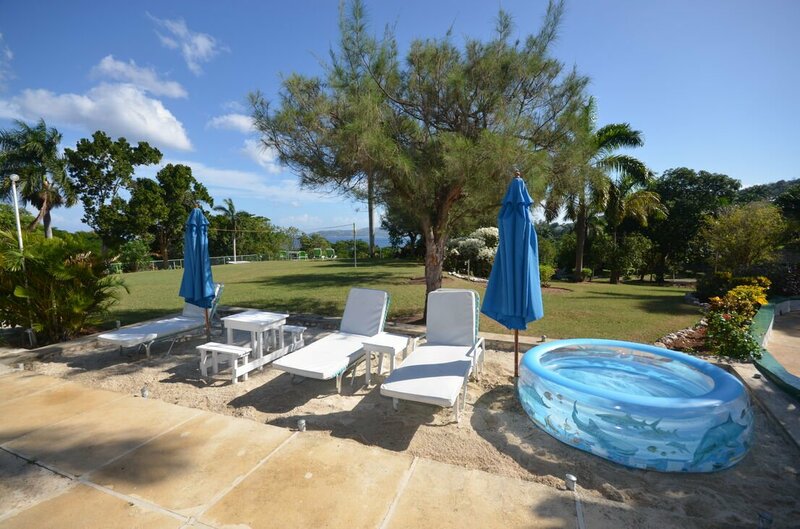 Pharos Summertime Villa has a Tryall Membership – this allows you access into one of the most prestigious villa resorts in Jamaica – this is about a 12 minute drive from your villa. With a week’s booking – you do get a complimentary van and driver for your stay in Jamaica! You are able to utilize the van and driver for up to 10 hours a day – go to Ocho Rios one day! Go to Negril the other day and see the famous Ricks Café and seven mile stretch of beach!. 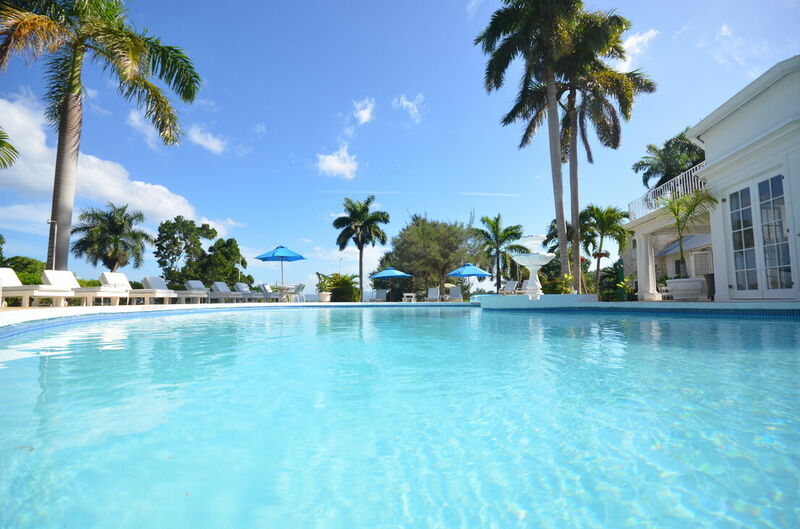 For the Tryall Club membership – the requirements are that the day you do go to the Tryall Club – the adults pay for $30 + taxes for the membership for that day. Kids under 16 years are free. 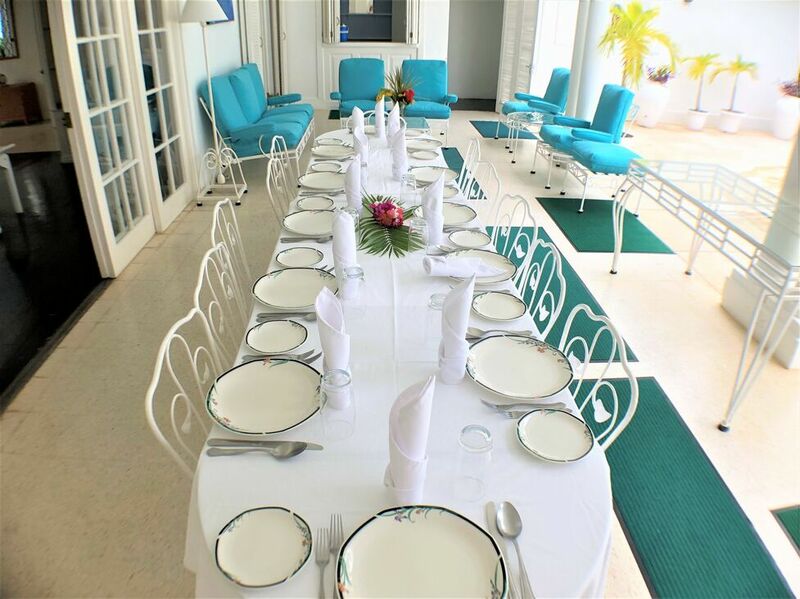 You register at the front desk at the Tryall Club and you are able to enjoy the facilities and the beach at this resort. Golf and restaurants and spa services etc will attract charges. It is not an all inclusive resort.